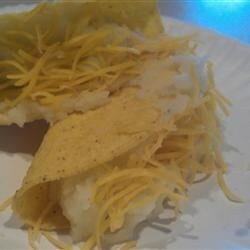 "Good kids' snack - crunchy taco shells filled with mashed potatoes, French fried onions, sour cream, butter, and cheese. Top with additional sour cream, cheese, French fried onions, and hot or mild sauce." Had something like this at a Mexican Taco stand! They were rolled and the potatoe mixture had green onions and cilantro added and deep fried. I had some leftover mashed potatoes and searched for a way to use them up. Tasted more like taco sauce on a baked potato than anything else. My family absolutely loved these! The only different thing we did was to top them with EXTRA cheese! Yummy!